The moment that Avatar really opened up for me was a massive spaceship travelling towards the viewer, the moon of Pandora, orbiting Alpha Centauri I. While that in and of itself wasn't anything new with science fiction, two things struck me: the first was how utterly real the spaceship looked, and the neat reflection of Pandora in the solar panels towards the rear of the ship. Avatar is the story of a crippled Marine, Jake Sully, who is given the chance to travel to Pandora and operate an Avatar, a genetically grown Na'vi, a native of the hostile planet. A corporation has begun a mining operation on the planet, and has had some difficulties with the natives of the world. Jake takes to this role like a fish to water, finding that his life in a new body is a liberating one, and soon, finds that he is siding with the Na'vi. James Cameron's movie set me back on my heels (figuratively) with Avatar. The movie is absolutely stunning in a number of ways, and most likely be one that will be a turning point in the movie industry. Despite an overly familiar plotline - not necessarily weak, just predicable - Avatar was an exciting ride from start to finish, a well rounded Science Fiction epic that should appeal to a very broad audience. Above all, the movie was fun to watch. For a film that has been in the works for over a decade, it's understandable that there is quite a bit of disapointment over the plot. For all the leaps and bounds that the movie takes, it's something like a new mustang. Very flashy, but with stone-age suspension. The storyline of someone spying, going native and turning against their own kind is something that's been used numerous times, and already, there are comparisons to Pocahontas, Dances With Wolves and The Last Samurai out there, and for good reason: that's pretty much what it is, just on another planet. There's not really any reason to believe that this particular storyline is weak - all of the above films have been nominated for Adacamy Awards, with several wins between them. Undoubtably, Avatar will be nominated for a number as well. Still, there is some lingering disapointment that the film didn't try anything rash with its plot. The film's visuals are so far out there that it's clear that everyone's attention was more about the appearance of the film than the story that they were telling. 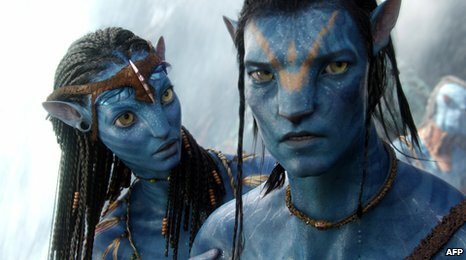 The story is simple, intermixed with narration and a rushed montage that detailed Jake Sully's intigration into Na'vi society in order to better exploit them. Throughout the entire film, you know what will happen next. But despite that, I just didn't care. Most of that can be chalked up to the astonishing special effects. Consiously, any viewer will know that just about everything that you see is digital. But, from the first couple of minutes, I was just sucked in to Cameron's fantastic world of Pandora. Where the production crew skimped on the story, they made up for it in the look and feel of the world. The jungles of Pandora are incredibly detailed, entire ecosystems that are not only realistic looking, but somewhat plausible. This element of the film lends itself beautifully to science fiction, and I can see why Cameron waited until the technology was just right to make the movie. Despite this, and some of the alien elements that are put into the ecosystem, Pandora and the Na'vi aren't really all that alien. The ecosystem is fairly logical with predators feeding on prey, and the primitive Na'vi society, while happy with their surroundings and existance, seems very similar to any number of 'primitive' societies on Earth, from their social organization to beliefs. There's little wonder that the company is dismissive of the claims, but then again, this is pretty shallow allegory. Of all the elements that really bothered me throughout the film were some of the characters. Where the plot was pretty bare, the characters are at best archtypes drawn out of the most stereotypical of hollywood characters. There's the uncaring company man, the daughter of the chief, the daughter's love interest, the crusading scientists and the tough as nails marine who disregards just about everything and is spoiling for a fight. There's very little nuance to the people here, and part of Avatar's biggest weaknesses with the plot and story. That all being said, its well worth seeing, because this film will likely reinvigorate the way people see movies in the future. 3D is here to stay, and hopefully will represent one of the biggest changes since George Lucas put Star Wars out to the general public. The graphics throughout looked good in a way that weren't intrusive to the viewing experience, and allowed me to really sit back an enjoy (or jump, when something appeared to come out of the screen) the film. While this movie wasn't necessarily the best example for paying more attention to storyline over visuals, the principle stands, and I'm eager to see what will happen next with films - I couldn't help but think that Star Wars will look absolutely fantastic with this technology, and adding an additional dimension to the screen allows filmmakers so much more that they can do to entertain the masses. In short, Avatar is an incredibly fun movie. Visually, it has no rivals - yet - while storywise, it's a little weak, but it gets the job done in grand, Science Fiction fashion.